Welcome to the Keeping Christmas Inspiration Hop! If you are looking for some inspiration for Christmas cards, you have come to the right place. Our team has decided to do a monthly Keeping Christmas Inspiration Hop! We will be sharing Christmas creations on the 25th of each month. 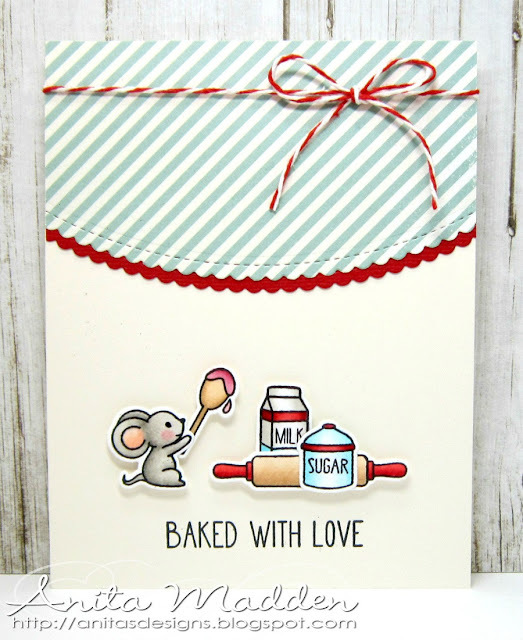 I used the adorable Holiday Baking stamp set by Neat & Tangled to create my card. I stamped the images on Neenah cardstock, colored them with copics, and then diecut them with the coordinating dies. I used the Stitched Scallop Basic Edges Die to cut the design paper and red cardstock that I adhered to the top of the card. I added a twine bow and adhered the images with foam tape. The stamped images are small so this really takes very little time to color, and the design is simple so I think this card could easily be mass produced for the holidays. Please hop along and be sure to visit each of the blogs. There's lots of inspiration and ideas to get your creative juices flowing! This is adorable, Anita! I love it!!! You always have such adorable and wonderful cards, Anita! This little mouse so cute and I love the blue/white strip scallop on top, reminds me of an apron or table cloth. Too cute! This is adorable, Anita! I really love the pale blue striped paper with these sweet images!